1. Can you give me some background on your career? I.e. how did you get into the industry? I come from a hospitality industry background. As a child, I admired the luxurious Grand Hotels and I wanted to work in one of them, serving the guests and making their stay unforgettable. After a degree in Hotel Management at a Swiss Hotel School in Neuchâtel and a BA in International Hospitality and Tourism Management at Bournemouth University, UK, my first job took me to the Hilton in Paris. I truly enjoyed two years in this wonderful city. Then I went back to my hometown in Basel, Switzerland, where I spontaneously applied to the company AKM for a job (the company was later bought by Congrex Group). I did not really know anything about the meeting industry at that time, I just thought “Cool, organising international congresses and being able to travel – sounds like a dream job”. It was purely a gut feeling; little did I know that I would fall in love with this industry. Therefore, 13 years later I am still with the company where I started at the registration department and now became CEO. 2. Does a particular time in your career stand out? Perhaps a project you worked on, a job promotion, an event you attended etc. The most exciting and scary time was in fall 2013 when we did a management buy-out together with external investors. Our motherhouse, Congrex Sweden, got into insolvency and our plan was to save Congrex Switzerland. It was an incredibly intense period where there were several moments when we thought that we would not make it. Nevertheless, in less than 3 months, we accomplished the MBO, we did not lose a single customer and met all financial obligations. I am very proud of this accomplishment. 3. What inspires you in the business and events industry? I think we are really privileged to work across the globe, visiting stunning venues and locations and meeting inspiring people from around the world with a very different background. There is nothing more rewarding than the end-result. Being onsite at a conference, feeling the vibe and seeing people enjoying themselves, connecting and sharing experiences. Despite all the stress, knowing that you put this together and made it happen, makes all the hard work worth it and is an ongoing motivation and inspiration. 4. Are you working on a particular project at the moment, if so can you tell me what it is, and your ambitions for it? I am very fortunate to take over a company after a very successful 2017, in which several important multi-year contracts with new clients have been signed and various long-term collaborations could be extended until 2023. 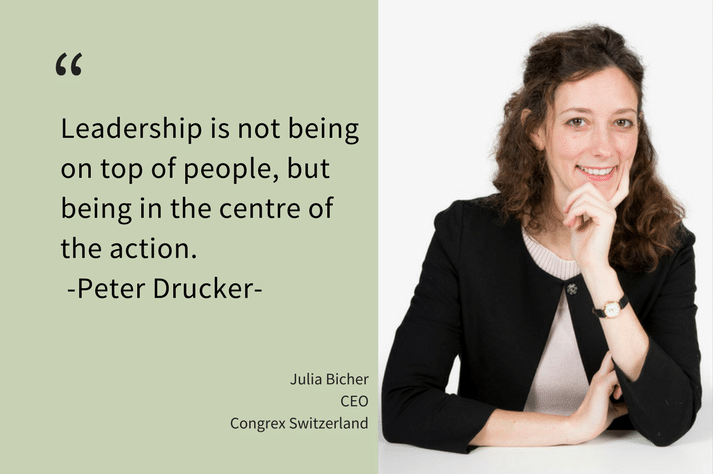 My focus in the next three months is clearly to redefine together with my colleagues the Strategy of Congrex Switzerland for the short and mid-term. On the one hand, we will continue to transform the traditional PCO Company based on logistical services to a true flourishing consultancy company in the area of association management, destination management and conference management, delivering expertise and exceptional customer service. On the other hand, we will also look into new business markets and customer fields, expanding our horizon. It is a bit early to say more about this, I will only start working on a re-defined strategy for Congrex in the upcoming months, having just started in this new position. We are certainly looking for growth, but in a controlled and reasonable way, while keeping our highest professional, quality and ethical standards. Our staff will be the main focus, as we strongly believe that leadership is not being on top of the people but being in the centre of the action (quote from Peter Drucker). My personal long-term goals are to achieve a healthy work-life balance, being a mother and CEO, and to encourage female workers for careers in this industry. Even though the majority of event planners are female, the senior management levels tend to be filled with males. I hope I can act as a role model to many female workers in this industry. 6. Do you have any hobbies and interests outside of work that you’d like to share? My job and my mother role fill out a vast majority of my time; time for myself is very much limited (I am sure that sounds familiar to many reading this!). Nevertheless, I try to read as much as possible; I love English and French books from the 17th and 18th century. I also love to be outside in nature, especially in the mountains. They always have a stress-relief effect on me, skiing in the winter and hiking in the summer time. Moreover, of course, I love to travel also in my private life, who from our industry doesn’t like to travel!